PCD Pharma Franchise in Himachal Pradesh – Apikos Pharma is a leading Pharma Franchise company committed to providing people with high-quality affordable drugs in Himachal Pradesh. Apikos Pharma provides a wide product range which is innovative and holds the capacity to cure the major health issues. The manufacturing of the products makes a place in the ISO9001:2015, WHO and GMP certified production units. The Company actively create many business ventures; under this Apikos Pharma is offering its top PCD Pharma Franchise in Himachal Pradesh. We are inviting to all pharma distributors & the medical representative from Himachal Pradesh to join hand with Apikos Pharma for the pharma franchise business. Apikos Pharma is top Pharmaceutical Company in Himachal Pradesh that offers Pharma Franchise and Pharma PCD of the wide range of pharmaceutical drugs, herbal drugs, and ayurvedic drugs on the monopoly basis. These include pharmaceutical injection, tablets, capsules, syrup, Ayurveda and capsules and are as per the norms of WHO. In order to offer quality formulations, we conduct tests on our range at regular interval for purity, accurate composition, and effectiveness. If you want to start your own successful business in the pharmaceuticals then PCD Pharma Franchise in Himachal Pradesh by Apikos Pharma is the best opportunity for you with you. Be our pharma franchise partner and work freely under no pressure. Apikos Pharma is among the top healthcare groups in the country. The comply work tirelessly to full fill its commitment to providing the high quality and affordable medicines to improve the quality of life in the country. With the experienced, dedicated and hardworking employees and pharma experts, we are producing the innovative drugs with the minimum side effects. 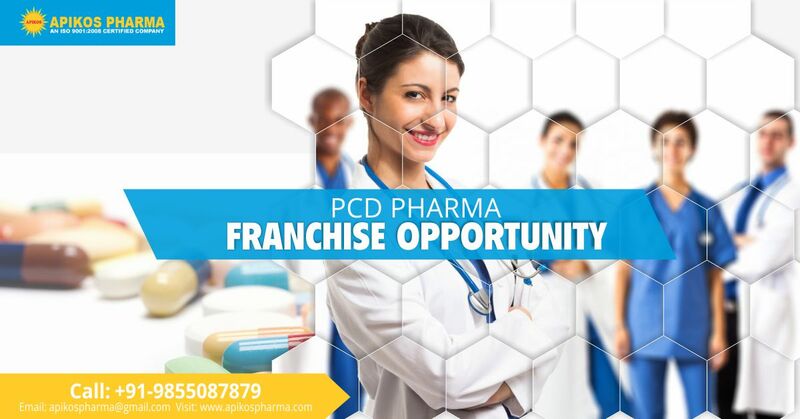 Associate with us for the PCD Pharma Franchise and start your own successful business. Apikos Pharma has won the trust of health professionals and doctors with its wide range of pharma products over the years. Our pharma Franchise partners will get a good profit margin on the products as well. Join hand with us for a growing and profitable business. Product Range for Himachal Pradesh: Apikos Pharma provides a wide product range that covers the various categories like Capsules, Syrups, Dry Syrups, Injections, Ointments, Soft Gel Capsules, and Sachets. Our products are manufactured in the certified production unit thus, they are best in quality and effective too. Apikos Pharma offers the best range of pharmaceutical medicine covering the varus health segments. All our products are highly effective and widely accepted by the people all across the country. Quality Assurance For Franchise in Himachal Pradesh: Apikos Pharma has a quality management team, this team looks after the quality of every product while manufacturing and ensure that only the best quality formulations reach out to the people. The company uses the best quality and hygienic raw material for the manufacturing. Our products are safe, pure and effective. All the manufacturing take place in the well equipped and high tech manufacturing units. All the drugs after manufacturing are stored in the spacious and germ-free zone. This ensures the quality of our products and provides the best quality to the customers and our clients. Promotional and marketing backup: Apikos Pharma provides marketing and promotional backup at free of cost to all its pharma franchise business partners. This helps them in coming up with the increasing competition and making a good impression among the doctors. The company provides the promotional kits which include the promotional tools such as Visual Aid set, safe MR bag, Catch covers, Reminder Cards, Product at a glance, Visiting Cards and small gift articles. Quality Packaging Prompt Delivery: Being one of the best PCD Pharma companies in Himachal Pradesh, Apikos Pharma is trusted for its prompt delivery of medicine throughout the region. In order to provide long shelf life to medicine, we make sure to use the best quality packaging mater with proper labeling on it. Join hands with the top Pharmaceutical company and get an opportunity to be your own boss in Himachal Pradesh. Himachal Pradesh has a population of 6.856 million which is growing every year. The healthcare sector of the state is good with the good number of government, provide and multi-specialty hospitals. Both and rural and urban areas of the Himachal Pradesh has improving healthcare sectors. The scope for the PCD Pharma Franchise business in Himachal Pradesh in this good. Apikos Pharma is offering the amazing business opportunity to the people of Himachal Pradesh. Apikos Pharma is among the list of PCD Pharma Companies in Himachal Pradesh which is known for quality medicine. All the products are manufactured in our own certified unit and after quality check delivered to associate. There are numerous Pharmaceutical Companies in Himachal Pradesh but it’s important to go for the most reliable one. Our PCD pharma companies in solan have been operating quite well and marked as one of the best WHO and GMP certified companies in Himachal Pradesh. We have associates from all over the country who rely on us and trust us. Apikos Pharma is one of the leading pharma franchise company best known for its ethical PCD Pharma in Himachal Pradesh. We deal transparently with all our associates and thus they rely on us for the best business opportunity and support. Our Franchise has maximum demand in Shimla, Hamirpur, Una, and Kangra. 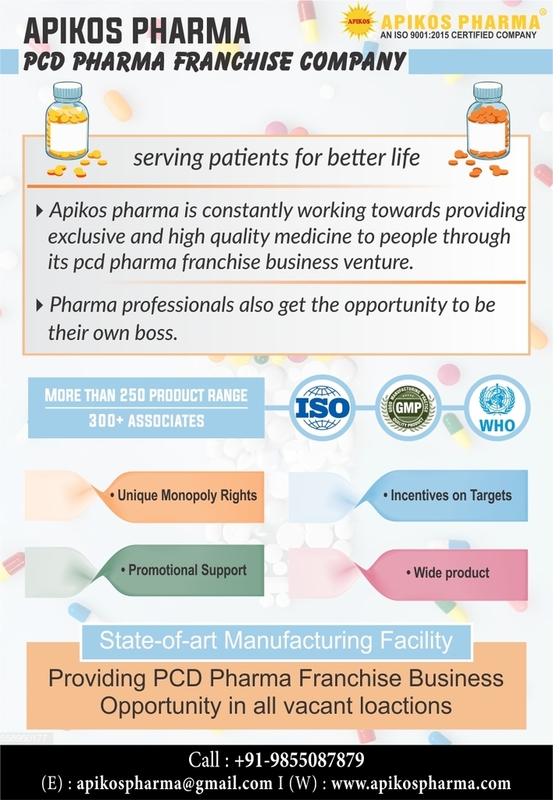 Apikos Pharma is an ideal pharma franchise company for PCD business in India. Start your business today and get the best support form our end. We make sure our pharma franchise partners grow with us. We have good reach in the market and provide our pharma franchise associates with the best business opportunity. Newsletters for associates to keep them aware of the latest update and happening in the pharmaceutical sector. The company provides good incentives for meeting the annual targets. The Company is well aware of the market scenario and thus, understand the increasing requirements for right marketing and promotional strategies. To cop up with the increasing competition in the market, Apikos Pharma has come up with the best range of promotional tools free of cost for its Pharma Franchise associates in Himachal Pradesh. Being one of the top PCD Pharma Franchise Company in Himachal Pradesh, we ensure to deliver our clients with the best than the rest. Apikos Pharma offers you a great opportunity to work independently.